I don’t know about you, but I grew up watching the Peanuts holiday specials. They’re a part of who I am, and a large part of that is due to the music that was composed and performed for the original specials by jazz pianist Vince Guaraldi. It helps to elevate the animated specials to a higher art form, especially in combination with Charles Schultz’s not-just-for-kids writing, and the fantastic watercolor sky backgrounds created by Shultz and his team of animators (which appear in most of the outdoor scenes in those 1960’s specials). Guaraldi, who died young from a heart attack, already had a productive jazz career going when he was asked to write and play the music for the first Peanuts special – the Christmas one. The story goes that Lee Mendelson, one of Schultz’s partners in bringing Charlie Brown to the screen, was in a taxi driving over San Francisco’s Golden Gate Bridge one day and heard Guaraldi’s “Cast Your Fate to the Wind” on the car’s radio. He immediately tracked the artist down and a contract was signed, with Guaraldi going on to contribute music to 17 Peanuts specials. 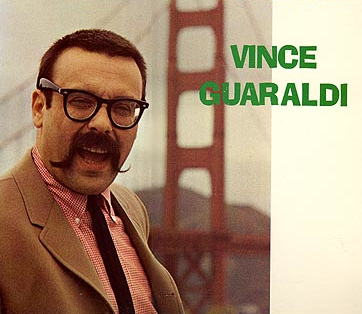 In addition to Peanuts, Vince Guaraldi did a fair amount of latin and bossa nova influenced work, along with the straight-ahead jazz he’s more known for, as in songs such as “Rio From The Air”. Perfect post for this week! I always loved the Charlie Brown specials. I’ve been a big fan of Guaraldi’s big piano sound since before the “Peanuts” tv stuff (which a whole lot of us grew up hearing). I actually became a fan when his rendition of “Cast Your Fate to the Wind” (which you wisely included here) was a US AM radio hit single. Does anoyone remember the simultaneous version (which sounded very similar) that made the charts in the UK? That was credited to a group called Sounds Orchestral (whose bassist, Tony Reeves, was part of the last phase of John Mayall’s Bluesbreakers, which spun off the late-60s jazz/rock band, Colosseum). Thanks for this excellent post, Rob. Guaraldi’s music added such sophistication to the Peanuts specials and were the perfect marriage to the animation and storylines. Probably the first jazz music I ever heard. The songs from “A Charlie Brown Christmas” touch a range of emotions. And I’m reminded of The Reivers’ cover of ‘Linus and Lucy.’ Fun! I’ll have to check out the Sounds Orchestral version – thanks for the tip, Stuart. Are you familiar with the little excerpt of Cast Your Fate in Joe Walsh and The James Gang’s “The Bomber”? It’s incorporated and played quite nicely in the middle instrumental section. Arthur – you know, I’d never thought about it – but I bet that’s the first place I ever heard jazz, too. And, yes, can’t forget The Reivers’ cover of “Linus and Lucy”! I’ve asked the band to include a recording of it on their Right Or Happy release (when and if it ever comes out), but I doubt they will. I think they see it as more of a fun, jokey thing they occasionally do. Oh, yes indeed, Rob. I had that 1st James Gang album, and I loved the stuff that Walsh contributed on guitar. The soaring ‘phased’ slide sound that he used on that excerpt was part-George Harrison / part-Duane Allman (before anyone knew that sound). I happened to be trying to teach myself some slide guitar at that time, and I played that lp for my garage band guitar pal (that’s Doug, who appears in some of our email chatter), and he was impressed.